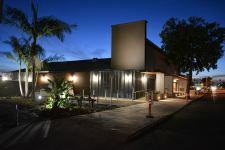 Ventura’s classic and most beloved bowling alley has gone through a multi-million dollar restoration and is now ready for your private event. Discovery is a unique combination of rustic-industrial, retro-chic, and modern technology. A complement of warm tones, leather sofas, and original artwork makes this venue unique, dramatic, and inviting. The upscale interior features party spaces, sophisticated menus, full service bars, and cutting edge audio and video systems. It is the perfect spot for corporate events, company team building, wrap parties, and premieres. If you have something to celebrate, this is the place to go!